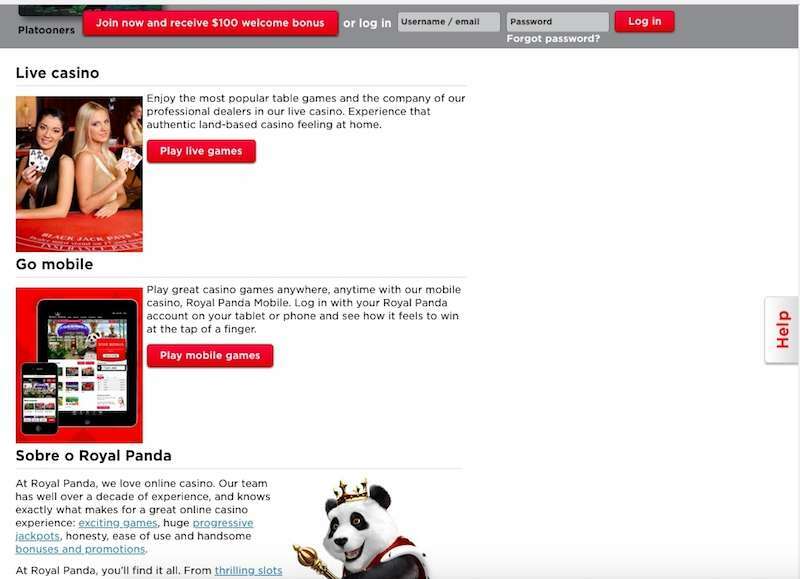 Royal Panda Casino is one of the most popular destinations for online gambling in the UK. It features an expansive collection of diverse casino games by world’s top software providers like Microgaming, Quickfire, NetEnt, Evolution, NextGen and the likes. Expect to find the best slot machine titles, old and new, live blackjack and roulette, a host of other table games as well as live sports betting, all under one roof. Unique promotions such as winning a trip into space! Promotions are not available in all the countries. The games have been made available on instant-play or no download accessibility at the casino’s highly functional website. The cross platform site is fully operational on diverse electronic devices including desktops, mobiles, and tablets. You can play to your heart’s content, and all you need is good Internet connectivity and an account. Most of the titles are available for free. You can gamble with real money as well as to win real money. On registering, you can grab a 100% welcome bonus, free spins and lot more promotional offers. Based in Sliema, Malta, in Southern Europe, Royal Panda was owned and operated by the Royal Panda Limited organisation. Only recently, it has been acquired by Leo Vegas. The casino is fully licensed under the Malta Gaming Authority and regulated by the UK Gambling Commission. Lead by the interactive Crowned Panda mascot, this casino features an impressive collection of all types of casino games. A smart tabbing system categorises different types of slot machines and other games that you can access with a single click/tap from the home page. Click directly on the “Casino” tab that will redirect you to the inner page featuring all the titles put in a clean grid view. With the first look at the “Most Popular” grid, it is evident that you have a decent suite of slot machines to choose from. You can pick your choice from the classics like Route 777, a wide range of video slots, like Starburst, or Twin Spin Deluxe, or dive into the hefty paying progressive jackpot titles like Mega Moolah and Hall of Gods. You have here the full catalogue by Microgaming, Quickfire and NetEnt. The virtual casino comes with an HD quality video streaming. A separate section under the “more” tab features the “Hot” and “Cold” slots, which simply notifies the player about the slots that have recently paid out, as well as those which have not. The hot slot denotes the one that has churned up a payout recently, and a cold means there hasn’t been a payout in quite some time. The choice is the player’s to decide whether they would like to bet on the titles that seem to be in the mood for a payout or on the cold ones whose calmness could mean that the next spin could be a step forward to finally bring out the long hauled cash. If you are on the lookout for other games than slots, then head straight to the live roulette or live blackjack rooms. When you are at Royal Panda live play online it feels as if you are in a real casino. Interact with real croupiers, or with other players, and even learn from their gaming methods. The live casino is broadcasted from a TV Studio and ensures a standard quality and unfaltering streaming of the entire scenario. Other than slots and live casino, you have all of eight video poker titles as of now. A host of table games includes Casino Hold ‘em, Pontoon Professional Series and Red Dog. Scratch cards and half a dozen soft games are there, which include Mega Money Rush racing game and Premier Trotting among others. Finally, there are ample opportunities in the sports betting rooms; these offer Football, Basketball, Tennis, Handball and 140 events worldwide. Coming to the mobile casino option, it is as impressive as is the desktop version. The mobile accessibility entails that you can enjoy some options while commuting or in a traffic jam. Or anywhere that doesn’t require you to be glued to your desktop. 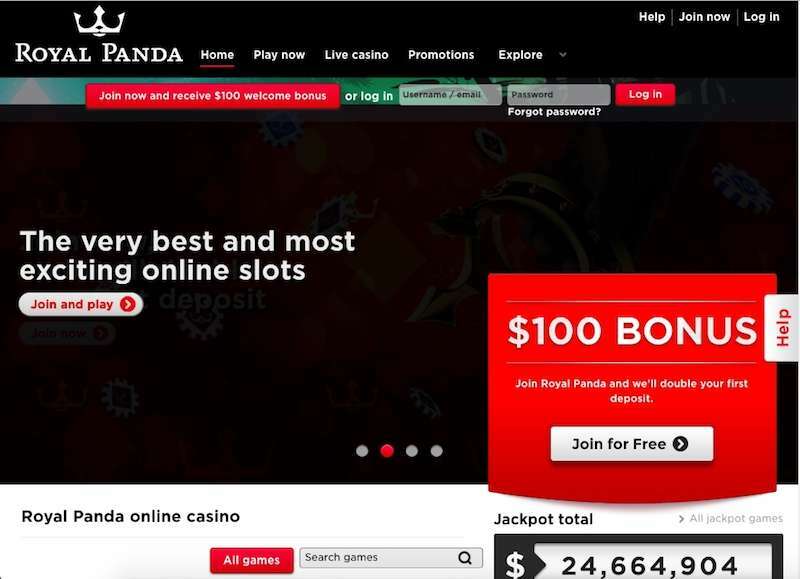 By just logging in to the website of Royal Panda play online for free, over 220 mobile casino games. You may log in using your existing username and password or use a QR code, to scan onto your smart device. The mobile site is compatible with most iOS, Android smart phones and tablets, as well as many other operating systems. Royal Panda Bonus and promotional offers come in a compact scheme. First of all, when you register with them, you deserve a 100% welcome bonus, limiting to a maximum of £100, plus 10 free spins, that you can use on selected games only. This means that if you make your first deposit with £50, then you will receive an extra £50, making your total balance £100. As an alternate option, you can choose between the welcome packages or go for the free sports betting. Depositing £20 will get you a free sports bet of the equal sum. This betting will also get you the Loyal Panda points for just playing. Next Up, is the “Bamboo Bonus” that will woo you every Friday. And it is a “casino exclusive” offer. It gives a player 50% match, on their deposit placed within a week. You can bag up to £150 or equivalent amount with this one. The Loyalty Program is called Loyal Panda which rewards its long-term player’s points on every real money bet. The points are useful in buying in-built purchases. However, the points have an expiry limit of 12 months. You may purchase free spins, special promotional offers and even electronics and apparel. In order to withdraw your winning amount, you ought to meet the wagering requirement of 35 times within a given time frame of usually 90 days. However, this timeframe might vary for certain titles at times. While you are using the bonus balance, the maximum bet per game is limited to £5.00 or equivalent in another currency. Certain titles may have it at £1 or equivalent in another currency. These titles include Dead or Alive, 1429 Uncharted Seas, Kings of Chicago and some others. This wagering requirement has to be met with money balance and not your bonus balance. You may use the bonus balance on the casino games, but the returns will vary which is mentioned in the table below. Note that before you dive into the deposit section, it’s crucial that you read the Bonus Terms and Conditions carefully. Also, only select countries are eligible for the “Free Spins” that comes with the welcome package. Moreover, the bonus is not available to first deposits made using any e-wallet payment methods such as Neteller and Skrill or the online payment system Paysafecard. Royal Panda features standard payment options. This includes MasterCard and Visa credit/debit cards, common e-wallets Skrill and Neteller, and Paysafecard, the anonymous prepaid payment method. You may also avail fast bank transfers. Added with a host of digital payment systems catering to the various countries such as the likes of Zimpler, which is a mobile payment option for Swedish and Finnish players. Trustly e-payment digital tool and many others. There is no bank transfer or wire transfer option for depositing cash, but it is available while withdrawing. Moreover, you may even use your credit or debit card details to get the cash transferred to the bank account associated with it. These main payment methods are added with specific e-wallets, e-vouchers and other digital payment systems operating in specific countries. Visa/MasterCard credit or debit cards. You won’t need to worry about any processing fees while withdrawing your deserved winnings using any of the above mentioned methods. The withdrawal takes standard time and is done through fully secure payment gateways. Royal Panda Online Casino has a wide fan following with its global presence. The casino entertains players from the European countries including the United Kingdom, Ireland, Isle of Man, Malta, Germany, Sweden, Austria, and Switzerland. Asian countries include India and Japan. Other nations include Canada, South Africa, Brazil, and New Zealand among many others. All the accepted jurisdictions are listed in the website’s terms and conditions page. The jurisdictions mentioned are the solely accepted ones, which automatically rules out all the others. That includes the US, Australia, France, Italy, and Spain among many others under the restricted tag. If you are still at a stage of confusion, you can always use the phone number given on the website or go for a live chat. Royal Panda has incorporated a multilingual and geo-specific website, available in more than 7 languages, including English, German, and Swedish among many others. The interesting thing is that even though the casino restricts players from China and Spain, you will find a Spanish and Chinese lingual website. This is probably to cater to Chinese and Spanish speaking individuals that live outside their countries. All the accepted countries can play using their native currencies that is the point of the geo-targeted website. However, the international number on the website belongs to Malta, so to avoid long-distance call cost, it might be a better idea to contact them using the live chat support, which is prompt. Royal Panda also has a facility where you may leave your number and complaint on the “contact form,” and they will get back to you from their side. This Royal Panda review will not be complete without the mention of the standard security, safety and fairness measures ensured for every player. The licences from the MGA and the UK Gambling Commission being already mentioned, also, each game undergoes independent audits to ensure their individual RNG rating. When you have catalogues of Microgaming and NetEnt that are handpicked based on their high RNGs, you can rest assured you are at a secure place. Finally, the payment gateways and personal data transmission gateways are secured with Secured with SSL encryption from Comodo. If you go through any Royal Panda review, one thing will be unanimously mentioned is the variety of casino games it features. 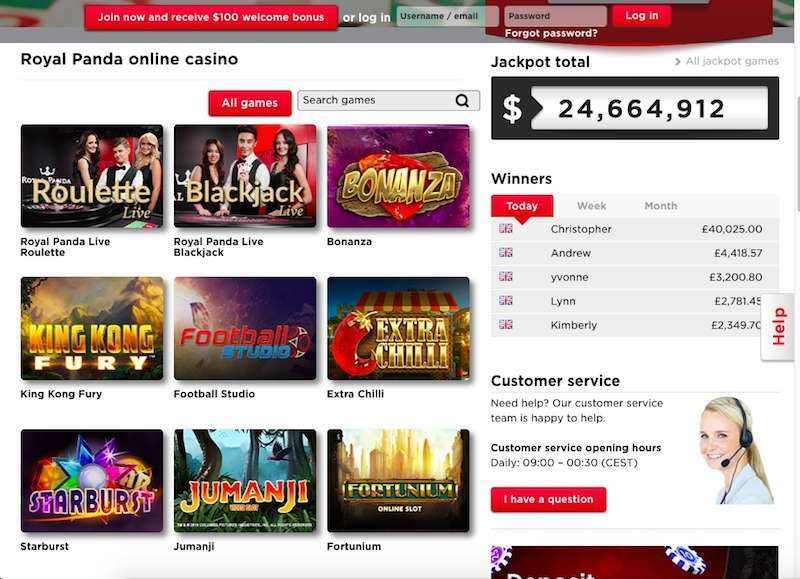 From slot machines to live dealer games, sports betting and even scratch cards and softgames. Despite their wide collection, they have factually handpicked their featured titles, ensuring that you have only the best of the best games on their website. That’s secure and fair, and gives you the best wins. The smart no download web interface, as well as the geo-targeted website, makes it highly impactful. Your gaming experience here is simple and fast, with their cross-platform functionality. The mobile site is pretty agile. When you are searching from specific countries, the casino search will land you to a webpage that speaks the language of that country, and/or mentions the terms specified for that location. Royal Panda Casino is one of the leading online casinos for some absolute reasons. They have systematically created their gaming portal, and have maintained clarity in explaining players the requirements. From the T&C, the promotions page, the separate “Help” navigation drawer on the right, all useful information has been well-provided, without procrastination or lack of resources.